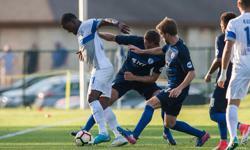 The Switchbacks took to Swope Park on Wednesday night, and were punished severely for their lack of finishing, a familiar issue for fans of San Antonio FC. They did well in the first half, and took the lead in the 23rd minute through an impressive bit of work from Kevaughn Frater to set up Eddy Prugh for the goal. From there it was all Swope Park Rangers as they took more and more control of the match, taking Colorado out of it and eventually breaking down the resistance of the Switchbacks to score two goals in the final 25 minutes of the match, despite strong goalkeeping from Moise Pouaty. Statistical Note: Two things have never happened for Colorado Springs against San Antonio FC, firstly they’ve never lost, they’ve played once and Colorado Springs won that match. The other thing is that Colorado Springs has never been caught offside by San Antonio FC. Key to the Match: The last matches for both of these teams highlight a key difference in one area, finishing. San Antonio was clinical last Saturday against Tulsa, including Kris Tyrpak scoring an incredible goal while sitting on his backside! Colorado Springs, on the other hand, struggled to finish their chances against Swope Park Rangers were not. “It’s the hardest thing to do in soccer” said San Antonio FC head coach Darren Powell about scoring goals, he’s not wrong. *in before anyone* score the most goals!